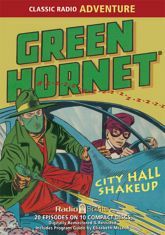 Mask in place, cloak flowing, gas gun at the ready -- radio's pulpiest crime-fighter prowls the streets of a corrupt American city as The Green Hornet! Hop aboard the sleek, supercharged vehicle known as The Black Beauty with wealthy young publisher Britt Reid and his faithful valet Kato for twenty thrilling tales of urban crime! Includes many rare episodes of this riveting radio adventure series, and a Program Guide by Elizabeth McLeod. The Green Hornet: Fights Crime!